A voluntary recall has been issued by SCA Pharmaceuticals, a sterile compounding company. The recall is for 11 lots of its injectable morphine and fentanyl products due to possible microbial contamination. The products associated with this recall were distributed nationwide to human and veterinary hospitals. The company not received any customer complaints or reports of adverse events related to this issue, the manufacturer stated. SCA Pharmaceuticals is notifying its customers via telephone, email, and the USPS, and is arranging for return/replacement of all recalled products. 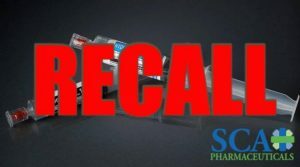 Customers who have product being recalled should discontinue use immediately and return the product to SCA Pharmaceuticals at SCA Pharmaceuticals, 8821 Knoedl Court, Little Rock, AR 72205. Consumers can contact SCA Pharmaceuticals at 877-550-5059 between the hours of 8 a.m. and 5 p.m. Central Standard Time, Monday through Friday. Complete and submit the report online at fda.gov.medwatch/report.htm; to submit by regular mail or fax, download the form at fda.gov/MedWatch/getforms.htm or call (800) 332-1088 to request a reporting form, then complete and return it to the address on the pre-addressed form, or fax it to (800) FDA-0178. For a complete list of products being recalled, visit the FDA’s original recall notice here.